G.O. 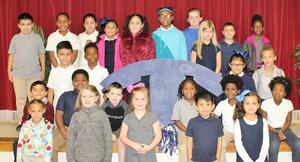 Bailey Elementary would like to congratulate and recognize the November Students of the Month. Each of these students was chosen by their teacher for showing outstanding behavior, work ethic and character. These students are role models for their peers and are always taking the extra effort to be respectful, responsible and safe. A special breakfast was held in their honor this morning, November 14th with parents and family present. Each child was presented with a certificate, coupons and special photo keepsakes. They will also get to enjoy a pizza party later in the month. What a great thing to be thankful for this November. Congratulations again to all of these wonderful G.O. Bailey True Blue students!